Developer Mines Excellence Golf Resort Bhd will build three five-star hotels within its RM3 billion Mines Golf City development in Bukit Beruntung, Selangor over the next three to four years. Founder Tan Sri Lee Kim Yew said it is looking to set up a boutique hotel, a wellness hotel with golden standards and a hotel for golfers for more than RM300 million. Lee said he is also keen to establish a university designed for golfers and a health clinic and spa. 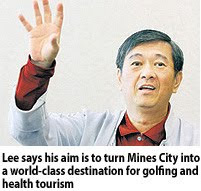 "My aim is to turn Mines City into a world-class destination for golfing and for health tourism," Lee told Business Times in an interview in Kuala Lumpur recently. "I want to set up a few golf and wellness hotels in Malaysia and it would be ideal to have two in Mines City," he said. Lee said he is ready to talk to boutique hotel and spa operators who are keen to set up shop at the golf resort. The 840ha Mines City is being developed by Mines Golf City (MGC) Sdn Bhd, a 70:30 joint venture between Mines Excellence and Country Heights Holdings Bhd, in which, Lee, has a 48.1 per cent stake. MGC will develop a 63-hole golf course on 320ha, which would be Malaysia's largest, and build townhouses, 500 bungalow lots, an equestrian and driving academy, schools, sports facilities, food outlets and parks on the remaining land. Lee said construction on Mines City will commence in early 2010 after it gets approval from the local council to develop the golf course. MGC has completed the piling work and signed up Swedish golfing superstar Annika Sorenstam to design the first 18 holes and South Korea's Se Ri Pak, the next round of 18-holes. Lee said MGC is in talks with other golfing superstars to design the remaining 27-holes. "There is a big business in golf. In the US, there are over 20,000 golf courses and more than 90 per cent are successful. There will be a big Japanese and European market for Malaysia going forward because of Sorenstam and Pak," Lee said. Meanwhile, Lee, who was CHHB group managing director but relinquished his position last year to focus on golf, said there is scepticism from the market on whether he would finish developing Mines City. "There is scepticism on whether I would be able to do it. A few years after I started Mines Resort City in Seri Kembangan, recession hit. People started talking. But I completed it in five years," Lee said. Mines Resort City consists of seven components including Palace of the Golden Horses, Mines Wellness Hotel (previously Palace Beach & Spa) and Mines Waterfront Business Park, built from 1993 to 1998. "MGC is free from encumbrances. If banks want to support the Mines City development, I am more than willing to talk to them. Right now, I am self-funding the project," said Lee.